Ahh Indonesia. Great weather. If you like it hot. and humid. :0) As you can see in the above world temp map, Indonesia is in a hotter portion of the world. Indonesia sees at a maximum, a change in daylight of about 48 minutes between its longest and shortest days; equating to an awesome year-round growing season with temperatures that are pretty constant throughout the year. To give you an idea of heat and humidity, when we were in Jakarta in May, it was typically between 80-90 degrees. The kicker was the 95% humidity (feels like 104 degrees when 85 out). In Borneo in May it was 91 degrees with 97% humidity (feels like 133 degrees). Check out this handy dandy heat index calculator if you want to see what it will actually feel like where you are going based on the temperature and humidity. Because of the heat, it is important to pack accordingly. However, you also have to be mindful of what you are wearing. While many tourists traveling to “hot” places typically get giddy and roll out the booty shorts, tanks and strapless tops, flip flops, and board shorts, if you want to stand out less and show that you’ve actually done some research and respect the people you around, do yourself a favor and leave he see-through (albeit, much cooler) tops at home. Ditch the booty shorts. Stow the flip flops for Kuta. In Jakarta, the majority of the population is Muslim. They pray multiple times a day and you can hear loud speakers blasting prayers at different times throughout the day. While many women still wear the traditional hijab (see photo at right), in this more modern day, a lot of women have put aside the hijab. Regardless, the majority of women in Jakarta wear shirts with sleeves that are not low-cut and shorts/skirts/pants/dresses that go past the knee. While you may see some women defying the “norm” in short-shorts or spaghetti straps, these women stand out completely. Do yourself a favor and get some linen pants or some leggings for under that dress. Additionally, I wore simple sandals- not much more than flip flops, but they had straps around the heel and looked a bit more dressy. Trust me you’ll be more comfortable- especially if you try your luck at walking around the city. You may not always find 100% perfectly maintained sidewalks. While we were in Jakarta, I frequently wore jeans that I rolled once or twice at the bottom to let some air flow up my legs with a pair of a sandals, a short sleeved-shirt and a button down 3/4 length sleeve shirt over the short-sleeved shirt (unbuttoned). I also brought a light weight halter dress (not a vneck but a straight across dress) that I wore leggings and a light weight shirt over so my shoulders were covered. As for the men, similar dressing/clothing means apply. Don’t wear booty shorts or see-through shirts or tank tops or flip flops. Stick to pants and polos or t-shirts or light button downs. Sneakers or comfortable shoes are preferable to flip flops. For work, Andrew typically wore khakis, shoes (think work shoes but not polished shiny ones– more comfortable Toms work shoes), and a button down. The biggest thing that you’ll notice is that locals don’t sweat nearly as much as you do. They are used to the weather or were somehow graced with non-sweating genes. They can wear layers or long-sleeves and look like they’re relaxing in the air conditioning… I on the other hand tended to look like a drown rat after 10 minutes outside :0). In Bali, things are a bit more flexible because of it being a major tourism location, combined with the fact that most people in Bali are Buddhist and thus you more rarely see the hijab. While in areas like Kuta, Lovina, and Ubud, you’ll find tourists wearing the whole gamut of clothing from pants to bathing suits, remember that rule #2 of traveling (at least in my book) is to always do your research and dress respectfully; even though you may still completely standout, it will look like you care and locals will appreciate it. A note on Bali temperatures/weather: while it is still warm and humid (80 to 90 degrees most days), if you travel to the mountains, you will find it to be A LOT cooler. When we traveled to Bali, we made sure to pack a sweatshirt or warmer long-sleeved shirt for mountain travels. A second note on Indonesia dressing/custom: Depending on where you travel, if you visit many Religious sites, you may need to rent or purchase a wrap or remove your shoes. In many of the larger touristy sites, you are not required to do this, but you should be especially mindful to not wear revealing clothing when visiting Religious places. Finally, note that it is considered a sign of disrespect to show the sole of your foot. While we never had locals mention anything to us, it’s something to make a mental note of and try to avoid crossing your legs in a way that shows the sole of your foot. Just something small that you can do that will be more respectful! 1. Wunderground (Website and Free App for Iphone Users): This App (and website) is fantastic for weather. You can search by zip or city or country. It will pull up a graph of the temperature changes over the past several days (and for future days). You can also see a map of the location, the temperature, humidity, and the “feels like” temperature. Additionally, with the App, you have the ability to select a “green check mark” or a “red x” to agree or disagree with what the App’s weather is saying– ie, social media/real time weather updates. 2. NOAA’s Heat Index Calculator (Website): Mentioned earlier in this post; this website allows you to plug in the temperature and humidity and spit out the “feels like” temperature. As anyone traveling to a new country may tell you; if you know the language, you are good to go. The reality is that oftentimes, we travel to new places and only know very little of the language or sometimes, nothing at all. Not to fear! In our experiences in Indonesia [with very little Indonesian knowledge] we were still able to have a superb time. Tourism in Indonesia is a big draw and a big business, so many Indonesians know at least some English. As mentioned in the previous post on where Indonesia is in the world, Indonesians are required to take English in school… so many of them know at least some of the language. Additionally, in places such as Bali, where tourism is paramount, many people go to school specifically to work in the tourism industry, so they too, know English. But I digress, back to language in a bit. Let’s start with money. For more information on exchange rates visit this site. 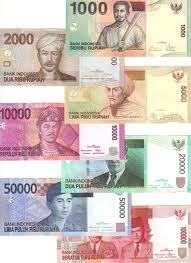 Indonesian Rupiah are extremely colorful and come in both bills and coins. The smallest bill that we have encountered is the 1000 rupiah. Coins are typically smaller denominations and although I recently read a website stating that it is possible to get a 100,000 rupiah coin, I have never seen larger than a 500 rupiah coin. 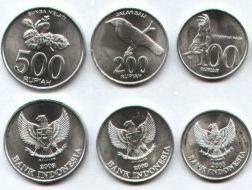 The bills come in 1,000; 2,000; 5,000; 10,000; 20,000; 50,000; and 100,000 rupiah. Based on the conversation rates to USD, a 100,000 rupiah bill is around $10. When you arrive in Indonesia, remember that you must pay $25 US for an on arrival visa. This can also be paid in rupiah if you happen to have it; we always make sure to carry US dollars with us just in case. So, we typically pay on arrival visa fees with that money. You may choose to exchange money before you arrive in Indonesia. You may also choose to exchange money once you arrive. We simply take money out of an ATM in the airport. This just seems to be easier for us. While you do have to pay a transaction fee, it is typically smaller than the cost of exchanging through a booth. The downside is that there is a maximum on how much you can take out of the ATM at any one time [around Jakarta we found this to be between 1,000,000 and 2,500,000 rupiah or roughly $100-$250]. Depending on your plans, this may or may not work for you. For us, it worked perfectly. If you are planning to go on an excursion of some sort and you book through the guide itself or a local Indonesian group, you will oftentimes have to pay the remaining balance in cash when the excursion begins. Because of this, taking money out of an ATM sometimes doesn’t get you the amount that you need, so be sure to keep that in mind based on your plans. Many places in Indonesia take credit cards, especially when you are traveling to larger or more tourist-like destinations such as downtown Jakarta [a mall, for example] or main areas of Bali. However, note that taxis do not take credit cards and smaller restaurants do not either. So, it is always good to have some money on hand and if possible, get some smaller bills as well [purchase a drink to break larger bills]. Food and drink prices are typically a lot less than you would see in places like the US and obviously, if you choose to eat from a street cart instead of in the mall, you’ll be spending less money as well. As an example, there is a Coffee Bean and Tea Leaf [yes i know, not Indonesian at all] in the mall under the hotel we stayed in when in Jakarta. We purchased an iced coffee and an iced latte and the total was 74,000 rupiah [over $7!]. In comparison, every day that we ate lunch near Andrew’s office, we paid 100,000 rupiah [$10] for two entrees, 2 bottles of water, 2 coconut shakes, and a coconut water with coconut meat in it. A final note on money in Indonesia- there is no tipping. Service industry employees typically are paid well [in comparison with those in the US at least] and the few times we’ve tried to tip, the recipients tried to turn it down! 2. Learn Indonesian (Free with option to upgrade for $5.00): A fun little app with categories that you would use/need to get around (greetings, general conversation, numbers, directions/places, transportation, eating out, etc.) The $5.00 upgrade will get you more detailed items like colors, family, dating, and feeling sick. 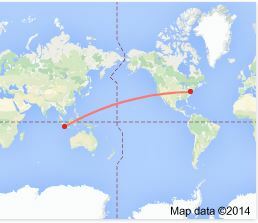 Yes you see that correctly- you literally fly around the world. 14 hours of flying- so make sure you find a good airline to spend more than half a day on! We went with ANA and departed on a Tuesday from Dulles, VA (IAD) around 12:20PM or so. The flight was pretty full but when we checked in, the woman working the ticket counter was super helpful and super nice. She said that she was going to move us so that Andrew was on the aisle. As it turned out, she found seats to move us to that also had an empty seat next to me. Remember here that our flight was booked less than a week before we left, so our seat options were limited. 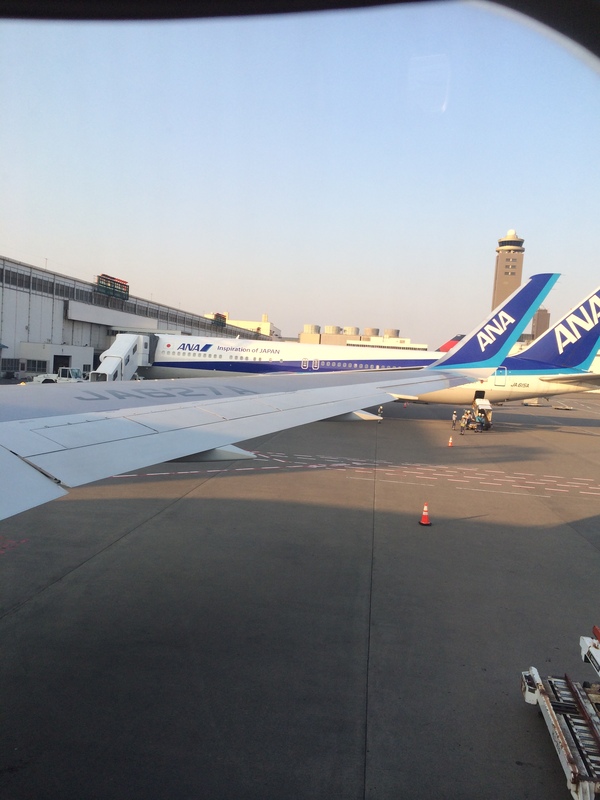 ANA was a nice airline; a really nice airline. You can access their website here: ANA Airlines. In the event you can’t find the flights you are looking for (happened to us because we saw them on Kayak but not on the ANA website), we gave them a quick call and they were able to look up the flights for us. In addition, they could put a 24-hour hold on the seat(s) which was super helpful considering I didn’t have a Passport at the time. 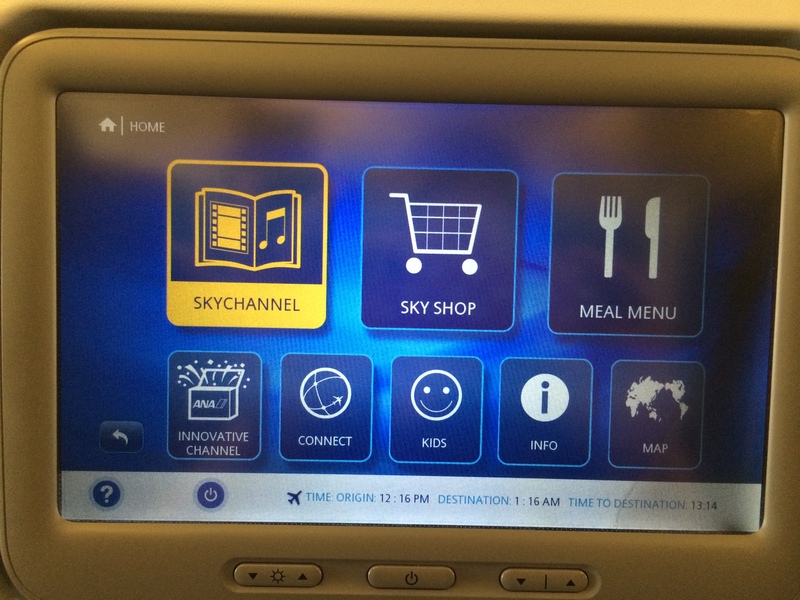 Each seat on the plane had it’s own personalized TV and remote (complete with TV shows, movies, games, chatting from seat to seat, etc). The movies were recent as well (Wolf of Wall Street, Secret Life of Walter Mitty, etc). In addition, I really liked that ANA had drink/cup holders that were separate from the tray itself (they also had drink holders on the tray). Sometimes, you just don’t want the stupid tray down but you are really thirsty. ANA has solved this problem. Other Airlines, take note. 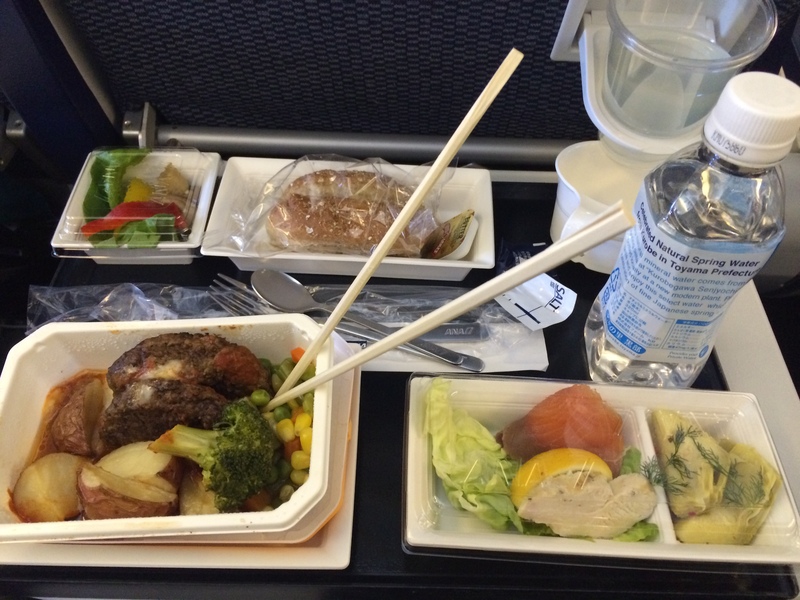 Because we boarded at Noon and flew for 14 hours on this leg, we were given lunch and breakfast/dinner. It’s called breakfast/dinner because according to local time (in Tokyo) it was dinner, but home time (DC) it was breakfast. The meals provided were actually pretty good. You typically had your choice of an “International Cuisine” or a “Japanese Cuisine”. So for example, the first meal was a baked fish dish or a hamburger. As much as I want to be, I just am NOT a fish person. So, we opted for hamburgers. For breakfast/dinner, we split the difference. Andrew got french toast and I got the lasagna. 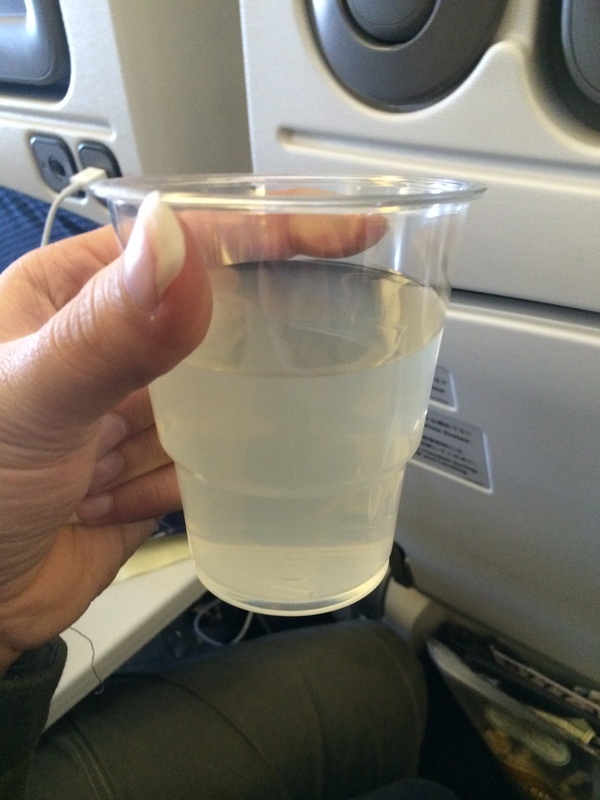 In addition to the main meals, the airline staff also walked around really frequently to provide drinks (sometimes the full cart, sometimes just tea or juice) and packets of rice crackers. By the way- watch it if you’re a vegetarian. 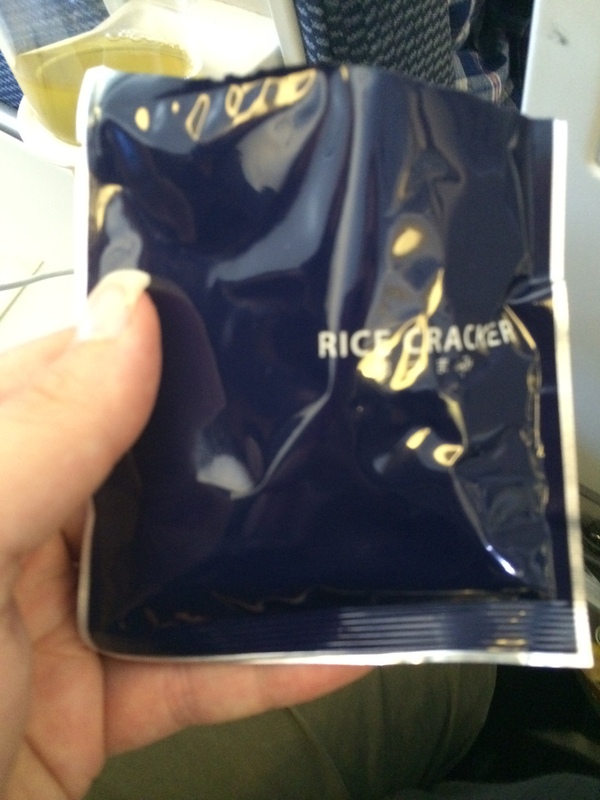 There were not any vegetarian dishes (unless you eat fish) and the rice crackers actually contained shrimp. So, if you’re a vegetarian, pack your own food. *Note- I just looked at the ANA Website and you can apparently request meals if you have dietary restrictions or religious reasons*. We actually packed some snacks as well because we knew the flight would be so long and we were unsure of the airline food. 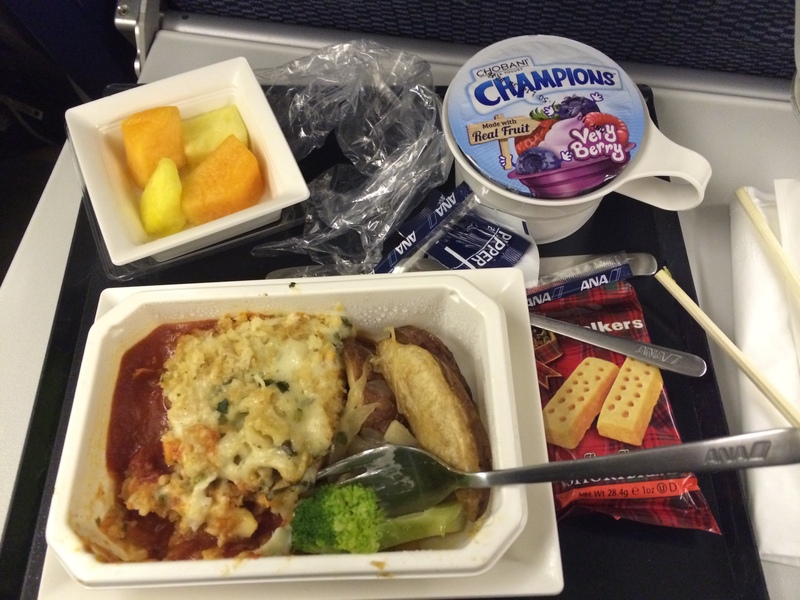 Easy airline snacks: trail mix, fruit snacks, sandwiches. In order to acclimate to the time change, we ended up staying up for the duration of the flight. It really wasn’t all that bad. We watched about 4 movies and we played A LOT of on-screen Sudoku. So, if you find yourself flying on ANA and playing Sudoku, check out the high score list for “Slumpy”– I’m there! Other important things to know about ANA include the bathrooms- they are awesome. It’s like a giant stall that you might find in a typical Western Restroom in a workplace. Lots of space. Leg room wasn’t too bad either and they also have foot rests that can come down if you’d like. 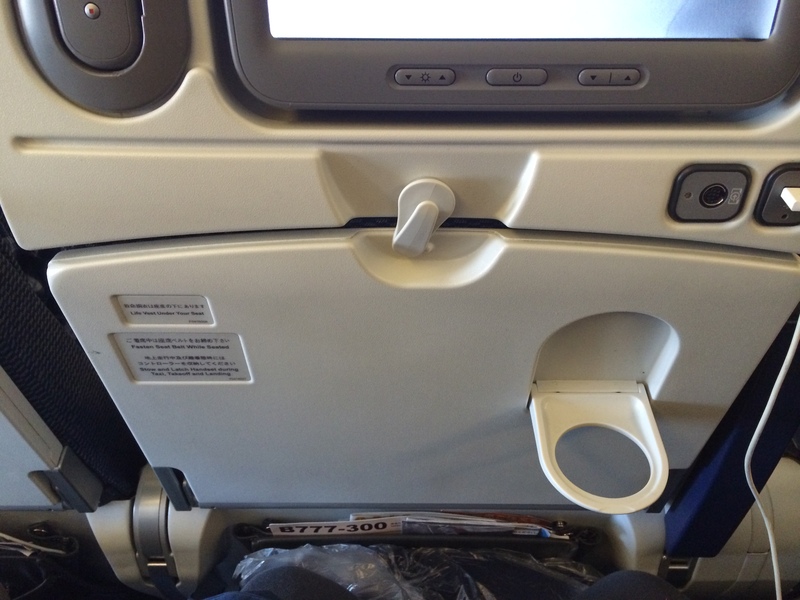 Additionally, the arm rests can be moved to upright position for optimal comfort. Sound like an airline ad? I don’t care- it was great. By the way, they also sell on airline goods like hairbrushes and ties and stuff. We landed in Tokyo and had a 2 hour layover. You basically leave the plane and can move on to your next terminal by going through a simple metal detector. Our bags were checked through to Jakarta which I highly recommend– it was a lot nicer than having to go find our bags and go through customs and what not. Do it. 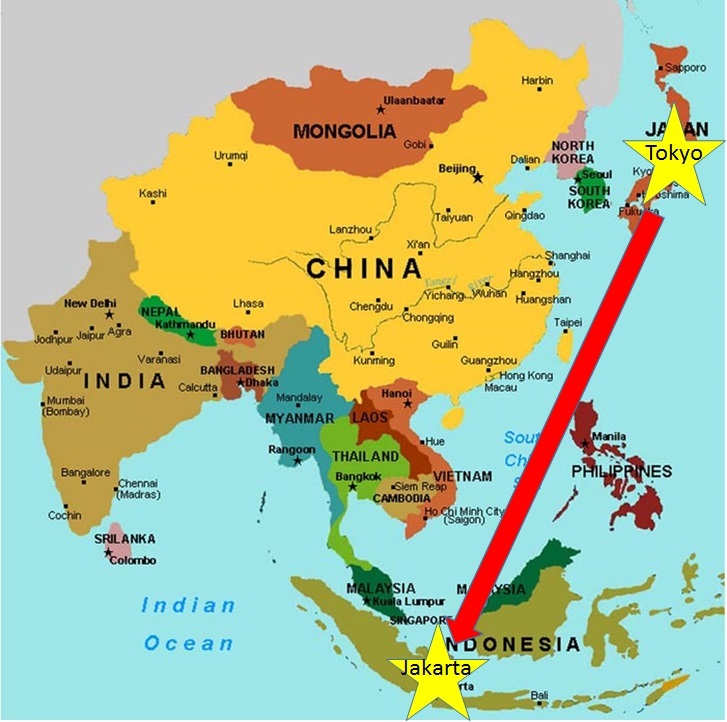 Our second leg of the trip was from Tokyo to Jakarta for a total of 8 hours. Really, it was nothing compared to our 14 hour flight. Plus, we slept most of the way. 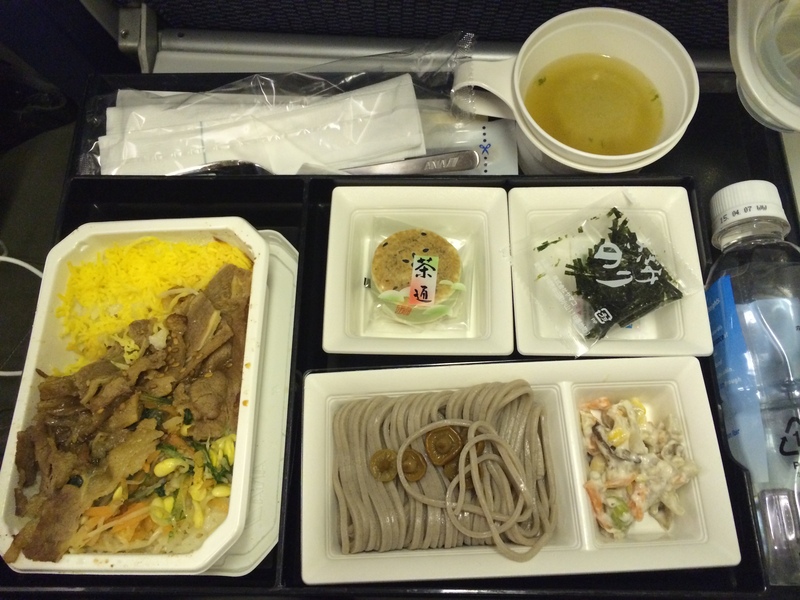 They served one meal on the flight and you again had your choice or fish or another dish– this time it was beef and rice and stirfry veggies with cold soba noodles and other goodies. Similar to the previous leg they again walked around with drinks and rice crackers. We didn’t really partake of them because we were sleeping (!) and trying to the local Jakarta time. We landed in Jakarta at around 11;50PM on Wednesday night (remember we left DC at Noon on Tuesday)… so a VERY long flight and a bit smelly and gross. Make sure you fill out all of your forms- immigration and customs to decrease waiting time in the airport. You have to purchase an on arrival visa for each person ($25 USD… or you can pay in Rupiah) at the appropriate window before you can go through immigration. You will receive two visas held together but perforated. The immigration official will stamp them and keep one of the slips. The other slip will be placed in your Passport- don’t lose it! At this point, you will also have a dated stamp in your Passport as well as a portion of the immigration card (the embarkation/disembarkation portion). You will need to hold onto this and show it when you want to leave Jakarta so don’t lose it! We have never been asked if we have flights or plans to leave Jakarta within the 30 day visa period, but the site below in the helpful information section and many other sites say that you should have those plans in order just in case you are asked for them. We grabbed our bags and made our way through customs (really lax actually- they didn’t even look at the fact that our form said we were bringing food into the country). Then we headed outside to grab a cab. The second you walk out, cabbies are calling and yelling to you. Because Andrew had been to Jakarta before and had coworkers here, he knew the best company- Blue Bird (they also run Silver Bird and Gold/Platinum Bird). The guy working the Blue Bird counter wasn’t even yelling at people. He was simply sitting and relaxing- that’s how you know they’re good ;0). We chatted with him and ended up with a Mercedes taxi that drove us to our hotel (40 mins or so) for about $20. In comparison, the guys next to us who went to a shouting taxi man were paying more than double, going a shorter distance, and getting a car with no A/C. So do yourself a favor- if you fly to Jakarta, look for Blue/Silver/Gold/Platinum Bird for your taxi company. Two thumbs up! About a week ago, I received a chat message from Andrew letting me know that his work wanted him to head back to Indonesia within the week to assist with the opening of a new office and the training of a few new GIS folks. Talk about short notice! The message also said “and you should come with me”. Well, naturally everyone would like to be able to drop everything and travel across the world in a week, right? How was I going to get my boss to agree to let me do this? Where was my passport? How expensive would it be and could we afford it? The second Andrew said “you should come with me”, I was sold. I wanted to come back to Indonesia so badly. Even if I would be on my own and most likely working to stay on top of things since I have a family vacation coming up in June. The second we got home that day I searched for my Passport. As usual, I found it– it was hidden in a place that I knew would be safe… naturally I forgot about that location. Sigh, it may be time to invest in a safe and just keep them in there. Anyway, I found my passport and started searching for flights. At the same time, I realized that my Passport expired in August 2014. This was a major road block. To travel into Indonesia, you have to have at least 6 months of active time on your Passport left… do the math. This was not good. I frantically searched the National Passport Information Center website. There had to be a way to fix this. I was supposed to be flying out with Andrew in 1 week. Surely others had issues like this that came up a week out from flying, right? Turns out, I am not the only one. I called the National Passport Hotline [1-877-487-2778] and spoke with a customer service rep. They asked me a few questions [including my flight date, whether I had the Passport in my possession, if it was in decent shape- ie, not torn or ruined, if I received my Passport after the age of 16 and if it had been issued in the last 10 years]. This was to determine whether 1] I was eligible for expedited service and 2] which form I needed to fill out for renewal. Based on that, I was told that I could call the automated system for National Passport Agencies and schedule an appointment at the closes agency to where I live. Awesome. 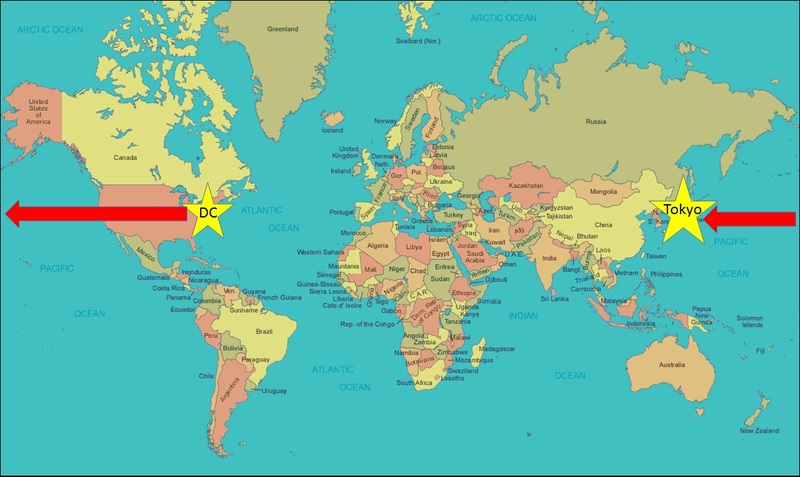 Did you know that there are 28 National Passport Agencies across the United States and that if you are traveling in less than 2 weeks, you can schedule an appointment at one of them? Well, now you do! They are located in major cities– luckily, one of them is in DC less than a mile from where I work! So, I called the National Passport Hotline again [1-877-487-2778] and worked my way through the automated prompts to schedule my appointment. All was well and dandy until it told me that the next available appointment was on Wednesday, May 7th. I was supposed to fly on Tuesday, May 6th. Crap. Andrew suggested that I try to schedule an appointment at the Philadelphia Agency, so I went through the prompts again and sure enough, there was an appointment available the next morning. I scheduled it. The problem with this? I would now have to buy a train ticket to get up there, a taxi from the station to the agency, another taxi back, and then do it all over again to pick up the passport when it was ready. At this point was frustrated and upset and just said you know what, it’s not worth it. I felt defeated. I wanted to go so badly. I ate some emotional french fries, shed some tears, and went to bed. How could I be so dumb as to not renew my passport earlier? ALWAYS RENEW YOUR PASSPORT EARLY. The next morning, I felt a bit better but was still determined to get on this darn trip. I called the National Passport Hotline AGAIN [1-877-487-2778] and explained my problem to the customer service rep. He transferred me to someone else. She transferred me to someone else. He transferred me to someone else. She is my guardian angel. I explained everything to her and she took down my information and asked me a few extra questions then put me on hold for about 10 minutes. When she came back, she had spoken directly with the DC Passport Agency [note, you can’t speak directly with them yourself, the Hotline reps have to] and she had scheduled me an appointment for Monday, May 5th at 10AM [ie, the day before I left]. Phew. Well, I was still on edge. If it usually takes weeks for a Passport renewal via mail, how can they process a Passport in one day? I had to trust the system which was very hard to do. I filled out my D-82 form [for Renewal, no name change, old Passport in-hand and issued after age 16 in the past 10 years]. I printed off my flight itinerary. I then needed a Passport photo. Andrew was going to take it for me and did take a shot or two in our Kitchen [only place with white walls]. After debating on whether there was a shadow or not for about 10 minutes, we said to hell with it, and headed out to CVS. After all, I didn’t want to leave anything else up to fate. Do yourselves a favor- go to CVS to get a Passport photo taken. It’s easy, it’s relatively cheap and you know it meets all the qualifications. 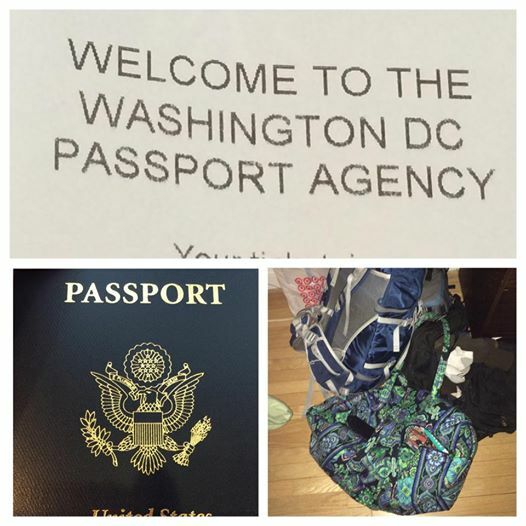 On Monday morning, I arrived at the DC Passport Agency at 9:30AM. I went through security [metal detector] and got in line for the “check in” booth. There were 2 people ahead of me. I got up to the window and handed over all my documents [itinerary, form, photo, passport]. She issued me a ticket and I took a seat. It is set-up like the DMV. Large room with glass windows, lots of chairs, screens showing the tickets being served. I waited 10 minutes. Seriously. I walked up to the window and handed my documents over. I had a pleasant chat with the woman at the window who wished me a happy belated birthday and then she asked for the fees– to be paid by check or credit card. I had already written out and signed a check [$110 for the renewal fee, $60 for the expedited service]. I handed it over- she thanked me for being prepared, printed me a “pick-up” ticket and told me to come back at 2:45PM to get my new Passport. At 2:15PM, I went back to the Passport Center. It closed at 3PM, so I wanted to be early just in case they don’t let people back in at a certain time. I went through security again. I went to the pick-up window, explained that I was early and then gave my ticket over. The guy at the window told me it would probably be ready at 2:45PM and that I should take a seat- he’d call my name when it was ready. At 2:20PM, my name was called. At 2:25PM, I walked out of the DC Passport Agency with a brand spanking new Passport book. My Advise: Always renew your Passport early, but if you get caught in a jam like me- call the Passport hotline. If you can’t get an appointment in time, call back, get a customer service rep and stay on the line until the schedule you an appointment. Two thumbs WAY UP for the DC Passport Agency. If you need to get a Passport in a hurry, check out this website for everything you need to know!